I admire Ben Affleck's comeback story as a doldrums actor turned respected director more than his actual films. Argo was a good film, overpraised for sure, but a leap above his two previous Boston crime films. The Town, loved by many, only generates admiration from me for being slightly better than Gone Baby Gone but mostly frustration for being aesthetically tepid, uninspired and simply adequate. This is Ben's Michael Mann movie, an ambitious aspiration, an action film with ‘character’. Ben Affleck plays Doug MacRay a lifetime criminal who plies his trade in the bank robbery capital of the United States - Charlestown Mass. While he's characterized as a professional thief with ethics and honour, his right hand man Jem Coghlin (Jeremy Renner) is a loose cannon who continually disrupts MacRay's plans, specifically in their latest job where we see Jem take hostage an innocent but gorgeous bank clerk Claire Keesey (Rebecca Hall). Since they were masked, after the job, Doug tracks Claire down and covertly starts a relationship in order garner information about the police investigation. But Doug falls in love with her, which of course runs counter to effectiveness of the crew. Jem in particular takes offence, causing a rift in their lifelong friendship. Meanwhile the FBI headed by Jon Hamm is hot on their tail, climaxing in a series of taut action sequences. The Town packs in a lot of plot, character and backstory, unfortunately it’s one of those movies where characters tell lengthy heartfelt stories of their past in order to get the necessary information across to the audience. This is passed off as 'character depth', but it usually comes off as a dull and lazy style of storytelling. 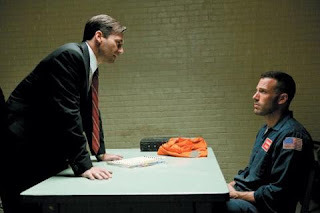 Jon Hamm also serves to explain the exposition. During his investigation he discovers the long history of the bank robbers, specifically for Doug whose family past influences his actions in the present. Other wise Hamm has no other significant narrative purpose than as the ticking clock for Affleck and his crew. The most interesting relationship in the film is between Jem and Doug, who are characterized like the Harvey Keitel/Robert De Niro relationship in Mean Streets, with Renner as Jonny Boy/De Niro and Affleck as the Charlie/Keitel character. Unfortunately Ben Affleck is so overly righteous and sincere to be a credible gangster. At every turn Doug seems reluctant to commit to his chosen trade. Yet, we never really see any internal conflict or regret for his life of crime. In the extended version there’s a montage scene early wherein we see the gangster crew living it up with strippers, drugs and gambling. Affleck even films himself looking surly while getting a lap dance from a red hot stripper. Even the sentimental ending, wherein Doug gets to atone for his sins, feels tacked on and false. I think what Affleck needs to do is get out of Boston, lighten up and stop taking his work so seriously. Between the preachiness of this film and the contrived melodrama of Gone Baby Gone, to use some Boston Red Sox baseball references his throwing smoke, but is too wild and off the mark, so far. Admittedly Affleck shows some muscular panache with the action. As such The Town seems to be the ideal stepping stone film for Affleck to find a franchise gig, like Jon Favreau’s attachment to Iron Man. So despite my indifference to this, I actually look forward to his third film.